Back when I was in high school I found a copy of a VideoHound guide called Cult Flicks and Trash Picks. Armed with this reference source and memberships to some video stores (the small-town independent ones were always the best) I discovered the wonderful world of cult movies, the B- to Z-grade fare of trash that spans the entire age of film. I was, am, a huge fan of Mystery Science Theater 3000 and still miss it. Some nights nothing hits the spot and helps fight insomnia or an overactive brain like a good piece of cinematic pulp. 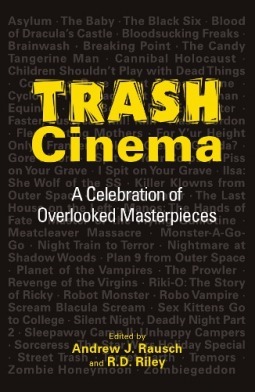 Even still, there are a large number of films covered in this collection of essays, Trash Cinema: A Celebration of Overlooked Masterpieces, that I wasn’t too familiar with. Including thoughts on over fifty movies (arranged by title alphabetically) the collection edited by Rausch and Riley is useful just as another reference list of cult movie titles that a fan may want to look up. Trash cinema (or B movies, cult classics, low budget dreck, or whatever-you-want-to-call-it) is still a highly variable beast. The spectrum runs from movies that are considered works of significant art to works that are barely watchable. In between are a lot of movies that are simply average and dull, having no particular infamy to even allow them to be ‘good’ trash. The essays in the collection tend to run a similar spectrum. As is fitting the genre, the essays are not remotely academic. Most are written in a colloquial language like the author is just talking to a friend at the video store. But they still vary in quality or usefulness in reading. A few I thought did little more than provide a film synopsis. The ones I enjoyed most got far deeper into some kind of analysis, and most entries at least did some. The movies discussed also run a spectrum across genres within this category of trash, from older movies to newer, SF to noir to horror, ones that are relatively tame to ones that have more adult violence or other depravity. Some trash movies of course try to push the envelope of depravity – or at least shock. One of the interesting points that came up throughout the essays dealing with this type of cult picture is that they often elicit very different responses between viewers, and even within a single viewer. Some days I can watch Cannibal Holocaust without a care. Other times I get hung up with troubling aspects. When is the shock used as artistic commentary on the society of the day? When is is just crass exploitation? When is it something that should revolt and offend beyond reason? Sometimes an extreme film is a bit of all of these things simultaneously. The advent of DVDs killed off the wide range of trash availability I could find with VHS. Recently I’ve found some Roku streaming options for these kinds of movies (Netflix is poorly lacking for the most part). So this collection was welcome and gave me good ideas for titles to put on my “to watch” lists, and also forewarned me of a few that I can tell won’t be for me. Overall a good resource for a trash digging fan.